Waiting for Frites N Meats. 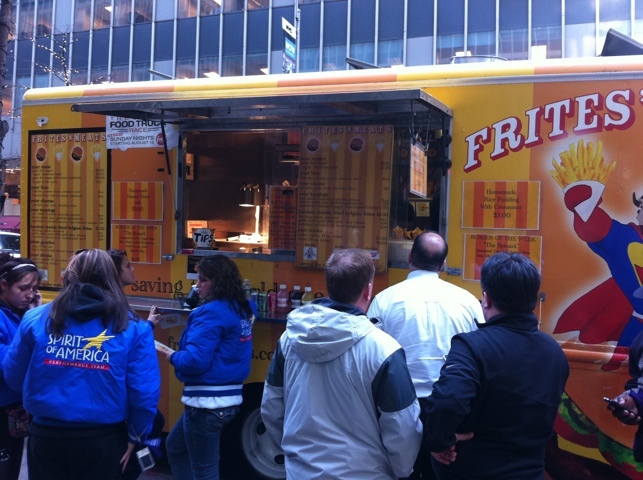 The Frites ‘N’ Meats truck was parked nearby my office today, and though I had previously tried it (and was somewhat underwhelmed with their burger) I’d figured I’d give it another run. Very glad I did, because lunch today was excellent. There was a moderate line, not huge, which was a lucky break. They have an interesting way of ordering: you fill out a wipeable card by circling what you want and turning it in. At the top of the card, they ask you for your super hero name (which they will call over the P.A. system). Naturally, I filled in Captain Awesome. 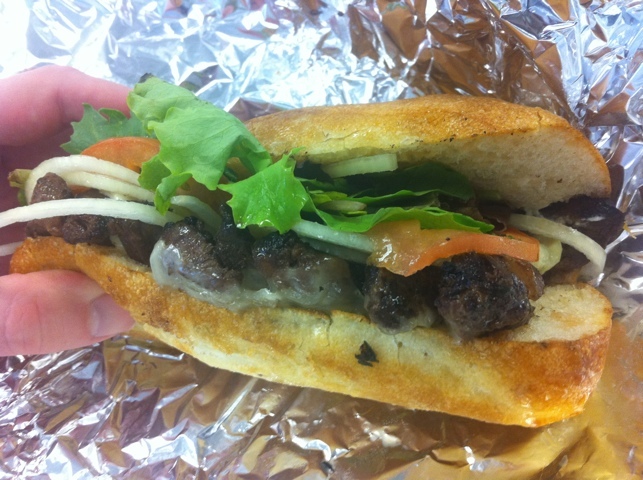 I opted for the special skirt steak sandwich on focaccia bread. They say the skirt steak is angus beef, and the focaccia came from Balthazar, so it seemed promising to me. Along with some fries (and garlic mayo), the whole thing clocked in at $12.50. Granted, that’s more than I usually spent on a lunch, but what I got for it was 10 tons of delicious food. Plus having someone call for “Captain Awesome” is pretty fun. 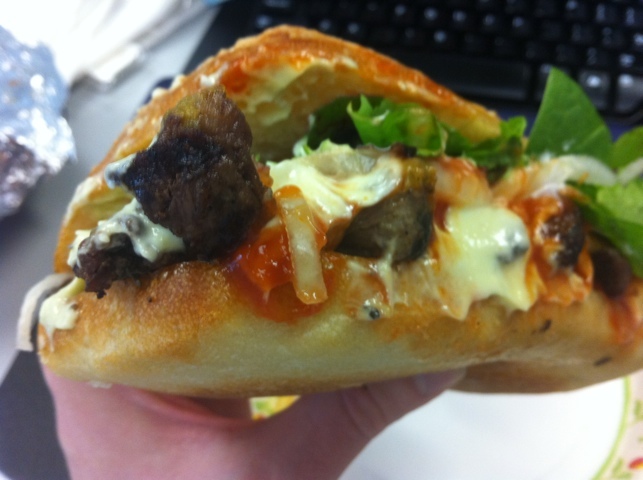 The sandwich (which I got with ketchup and mayo) was a winner. The bread (which is not dietetic and plentiful) was very fluffy and fresh. Tender, but with enough firmness from the crust of the focaccia. The skirt steak was just delicious. Not too fatty, but fatty enough to be suffused with the wonderful beefy flavor. I was concerned it was going to be shoe leather. Wrong – it was savory, tender and had a delicious fresh-grilled flavor. Covered with mesclun greens and onions, it was an utter winner. Granted the meal is not dietetic at all (so much bread!) and it is Thanksgiving week, which is also going to do damage, but what a pleasant diversion from the usual. The fries are salty and crisp, an improved variation on McDonald’s (which while having a definitional flavor are wilted, sorry strings). 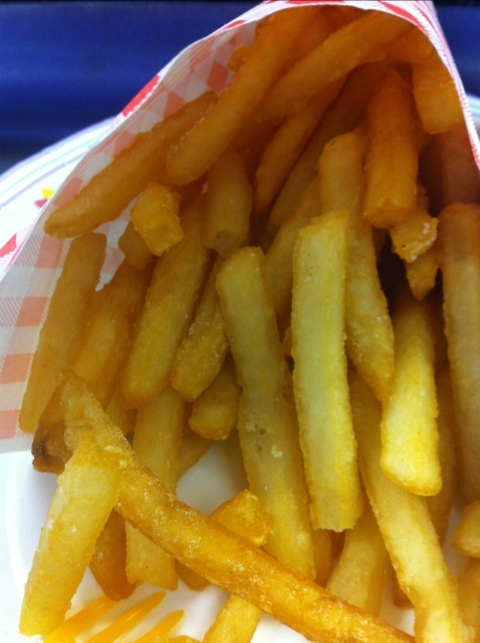 These crispy frites had a good salt, and the garlic mayo was delicious. Travels through NYC, check their website for location.